The Embassy has developed and launched a new websites to introduce our activities as well as to provide the necessary information to the viewers. 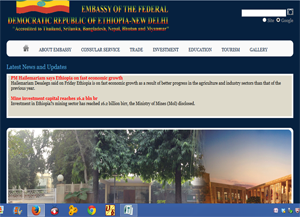 It provides detailed information to visitors with regard to business opportunities in Ethiopia, the embassy's consular services and current undertakings. The embassy hoppes that tour viewers will give us suggestion, comments and the likes on the contents of the website.